WHAT MAKES THE TWISTER A GREAT GIFT? Four banks of 16 high-resolution encoders with a configurable button on every knob. Little space, lots of control. Multi colored LED rings that provide clear feedback on a knob's position. Always know what's happening without getting lost in the software. Compact and completely USB-powered, the Midi Fighter Twister is easy to fit into any gear bag and integrate into every work flow. The MF Utility software allows you to customize everything including LED Color and switch styles for advanced control. With 64 flexible knobs and buttons, this is the most compact and powerful studio controller for automation out there! The Twister comes with a hardware step sequencer designed for Traktor that turns a remix deck into a powerful drum machine. "I'm sooo psyched on the Twister, it's helping me get control over a strained setup of multiple IOS devices (running Synth One, Troublemaker and Animoog), a Minikorg and Ableton. I'm not there yet but getting closer each day ( I should prob RTFM). Endlessly versatile and adaptive, this will relieve that knob twiddling itch and add a tactile satisfaction to an otherwise non-gratifying touch surface device. I was initially concerned about redundancy of this with my Push2, but I feel that each can hold it's own with a dedicated purpose. I added some Chroma caps to help me remember the functions and Chroma cables to help makes sense of the train wreck of wiring I got goin'. Get it, give it a chance and you'll wonder how you got along without it. -Wayneward Distractions"
"Man look...I'd put off grabbing a Midi Fighter Twister for long enough. As Popeye would say, "That's all I can stands, I can't stands no more!" With wondrous potential at the fingertips, its functionality, power and control, when melded with Traktor's remix decks is phenomenal and literally inspires new life and inspiration into my mixes and production style. It urges creativity. Every dj and production setup should have one! Thanks DJTT"
The Twister features 16 endless encoders without any end points that provide un paralleled flexibility. Each knobs position is dynamically shown by LED multi-color rings, so you can seamlessly switch between banks, effects, plug-ins and synths. Control your entire rig from a single device, while everything stays perfectly in sync visually. Always know what is actually happening in your music. "Wish I had purchased this when I first began to learn Ableton Live. Makes creating on Live even more intuitive and fun. Excellent product!" We have built 5 exclusive MIDI features designed for producers and live performers that will double your control surface. CC Toggle - Push down the knob to turn an effect on and off, like an EQ for instance. 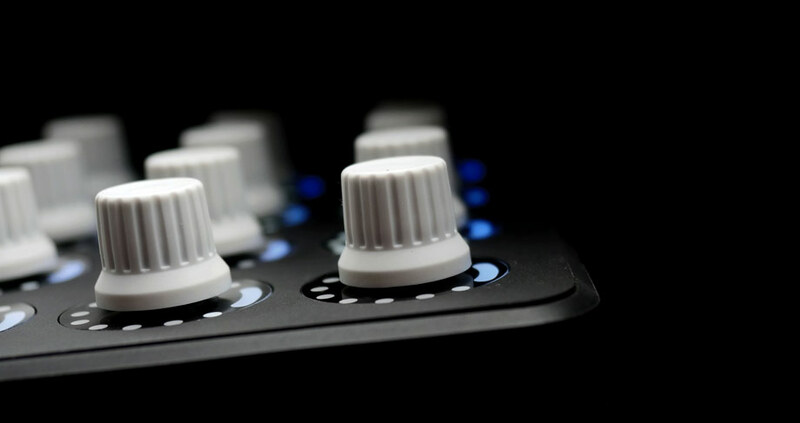 DJ Filter - A 1-knob DJ Filter. Great for pan or a combined low pass & high pass filter. Push to Reset - Push down the knob to reset encoder value. Great for filters and master effects. Encoder Fine Adjust - Normally the knob controls a wide midi range. Push and hold a knob to enable super fine control. Great for EQ or synths. Shift Encoder Hold - 2 knobs in one. A knob twist will send one midi message. While pressing down a knob, the same knob will send a separate midi message. Every succesfull producer in the world has personalized their workflow to make amazing music. Your controller should allow the same. Combine The Twisters flexible encoders with an Ableton Template so that every time you have an amazing idea, a powerful studio environment is there to support you. "I use it for everything now from controlling my effects to my soft synths. With four banks of precise rotaries and push buttons this is my new favorite. Being able to edit multiple controllers in a bank also makes customizing a breeze..." Edward - Twister Customer"
We spared no expense in sourcing the best endless encoders from the world famous ALPS company that are suitable for live performance and studio work. The twister's knobs have a silky feel that is completely unique and will not be found in any other knob - because they are custom made for us! The controller is used a lot for DJ effects. For example: Twisted Gratification unlocks 16 combo-effects in Traktor enabling Richie Hawtin and Dubfire style effects with the single turn of a knob. A release-all knob turns off all effects with an echo in just one press. The Twister is equipped with some very special PUSH encoders that allow turn control with a built in button. This doubles your control surface and provides far more performance in a tiny footprint.
" It's like a 20k mixing desk in your back pack! This is all I need for mixing and writing in Ableton Live"
The Twister comes with a hardware step sequencer designed for Traktor that turns a remix deck into a powerful drum machine and works with pretty much anything that can send a MIDI clock signal. Worried about your other banks? It lives in a 5th bank and can be used along any other mappings you feel like rocking on stage or at your studio. 16 high resolution encoders with integrated push switch and LED feedback. USB bus powered - no wall adapter required. "The Midi Fighter Twister is exactly what was missing from the world of CC based controllers. The push encoders are the perfect nexus of button and knob, cleverly programmable and designed with the level of quality and polish characteristic of DJ Tech Tools." "The MF Twister has fast become my trusted go-to controller for encoders. It soars above the competition in terms of quality, versatility, and portability. Everyone needs a good set of knobs, and the Twister delivers." We ship controllers every day to happy customers around the world. The FedEx rates are affordable with fast arrival times and reliable tracking. Often, it's less expensive to purchase equipment directly DJ TechTools than a local store due to distributor mark-ups, even with import taxes. Please use this table as a guide to get an idea of what your landed cost might be. "Fantastic product, Build quality is great. This is the perfect device for a step sequencer in Traktor. It is better than my D2 for this. I wish I bought on sooner if is fantastic. Highly recommended. " "High quality build and tons of focus on the most miniscule detail. It feels sturdy and nice to the touch. The encoders are smooth and the LED lighting is vibrant. I wasn't even expecting the indentation underneath - which makes carrying it easier, but is the perfect side to tuck and carry the associated USB cable. Love it, thank you!" "What is there to say? There are basically no other options for 16 high-quality encoders with visual feedback in a MIDI controller. The out-of-production BCR-2000 is the closest animal, and it's bigger, more expensive, and no longer being supported or updated. This is a no-brainer if you need more knobs." "I use the Twister with Presonus Studio One-4. All i can say is that it is a pleasure to have four banks of 16 programmable encoders and push buttons. the color coding is nice to keep track of where you are. I use a bank for mixing and a bank for Omnisphere controls The build quality is top notch,,,very solid. Nothing cheap about this box. I love this thing.."
"It's really something unique. I purchased this product after seeing it mentioned in a blog that described using midi translation software to utilize midi controllers for editing photos. I had always wanted to have physical dials to control all the settings in photo editing and this one looked to be the perfect controller. Fast shipping across the country, and great supporting software as well. This controller has worked great for me and the more I learn within the midi translation software (Bome), the more useful the controller becomes and I'm still only using bank 1! There's 3 more banks plus the side buttons!! So versatile. The colors of the LEDs are superb as well. You can tell that a lot of thought and engineering went into this device. I like this controller so much that I ordered a Midi Fighter 3D to complement it, and to start learning some sampling controls in Ableton and Traktor. Not to mention that both controllers will be used to produce my live streams by controlling the scene switching and graphics! Powerful stuff!! " "Probably the most versatile piece of midi equipment I have at the moment. Awesome buy. " "Build quality is top notch, software editor is excellent, customer service is superb. The device has some minor issues interacting with other controllers/mapping within Ableton, but nothing serious. Overall it's the jam. For a box of knobs that's compact and powerful, I don't think there's anything better out there. " The Midi Fighter Utility is an essential tool for configuring and updating your Midi Fighter and you don't need to keep it running while performing with your Midi Fighter. Midi Fighter Twister User Guide - Includes everything you need to know about configuring and mapping your Midi Fighter Twister. Midi Fighter Traktor Quick Start Guide - Makes it easy to get started using a Midi Fighter in Traktor. Traktor Sequencer: Use Traktor's Remix Decks for powerful drum and sample sequencing. Traktor Stem Decks: Use Traktor's new Stem Decks to mix different elements of your songs effortlesly. Ableton scripts/templates: Ableton certified trainer Lenny Kiser as well as DJTT's Mad Zach and Matias are building Ableton tools!